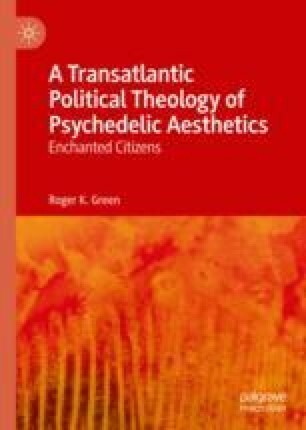 This chapter addresses the persistence of perennialism in thought and discourse around both psychedelics and aesthetics. Beginning with discussions of tropes about childhood and primitivist thought, it connects the aesthetics of nostalgia to a broader colonialist discourse. More discussion of Artaud’s internal critique of the European tradition occurs, and connections are made to Mircea Eliade’s employment of the European phantasy structure. Explications of Diane di Prima, Timothy Leary, and The Fugs appear. Brief connections are made between psychedelic aesthetics and structuralism, followed by an account of the aesthetics of exhaustion.